We may or may not have met before, but as a budding presuppositionalist I share your passion for presuppositionalism as I too believe this apologetic approach is most biblical and most glorifying to our great God and Savior. I also believe it is our duty to declare what God has revealed in Scripture – whether about Himself or about people – and not make apology or excuses about His revelation. Neither should we attempt to prove God or His revelation through evidences, rather we must believe and assert the Scriptures which testify to every man’s knowledge of the existence of God (Romans 1:18). But, I have also observed some things among fellow presuppositionalists that concern me, and I hope you might hear what I have to say so to exhort you to walk humbly with our God and in a manner pleasing and honoring to Jesus Christ. Perhaps similar to what is referred to as “cage stage Calvinism“, I wonder if there is an element of “cage stage” that some Christians experience when they are first exposed and embrace the presuppositional apologetic. For some, it seems there may be a tendency to beat one’s opponent to death with their newly found weapon of choice, dismantling their opponents worldview with crushing blows but never leaving them anywhere to land (on the Gospel). Thus, the end goal is simply winning a debate or argument, for perhaps self-satisfaction or grandiosity. For others, while possibly not engaged in many formal or informal debates with Atheists, they rally around the wagon of their favorite presuppositionalist when debates do ensue. At the first smell of blood or challenge, they root for their favorite MMA fighter presuppositionalist hero to destroy the one who would dare challenge the presuppositionalist and his Christian worldview. Now, I do think there is value in these kinds of debates so long as there is humility and graciousness extending from the Christian. I’ve learned much from my friend Sye Ten Bruggencate, for instance, and am better equipped to minister to Atheists for it. I even think Sye will appreciate and agree with this letter of admonishment should he read it (turns out he did in draft form, and he “FULLY” endorses it – emphasis Sye’s). But when the reaction from the cage stage presuppositionalist is basically, “you’re gonna destroy that Atheist” or “that Atheist doesn’t have a chance” or “bring it on, Atheist Bad Guy” – I think you’ve missed the point if this refers to you. Presuppositionalism is a powerful tool and glorifying to God if used rightly. But it can be abused just as one can hijack the beautiful truths of the towering doctrines of grace for their own promotion and belittling of others. The doctrine of election should be the most humbling truth of Scripture to any of us, but the cage stage Calvinist can abuse its wonder and majesty and harm those who have not come to the same right conclusion as he. Likewise, understanding presuppositionalism should give us greater understanding of the depravity of man and sovereignty of God, but we need to be careful not to abuse its power. It should humble us, not instigate fleshly pride. You are not being patient or gentle when you seek the defeat of the Atheist for winning-a-debate’s sake. You certainly do not come off as desiring their God-granted repentance through the ultimate power of God in the Gospel (Romans 1:16). Consider where you once were and how gracious God has been to you to not only reveal Himself savingly to you, but also in revealing His manifest wisdom and glory as you grow in the knowledge of His wisdom and grace. Never forget the Atheist truly is dead in his sins (Eph. 2:1); he truly is blinded by the god of this world (2 Cor. 4:4); he truly does walk according to the prince of the power of the air (Eph. 2:2); his mind truly is futile and darkened (Eph. 4:17-18); he truly cannot discern spiritual things (1 Cor. 2:14) – just like you were and couldn’t. No matter how foolish the Atheist is in his worldly wisdom, no matter how much he ridicules and mocks, have compassion on him (Ken Ham did this well in his debate with Bill Nye). Remember he truly needs God to shine His light through his heart so he can see the glory of Christ and repent and believe (2 Cor. 4:6). By all means, study and use the presuppositional apologetic to the glory of Christ and for the sake of your unbelieving opponent, but do not bring reproach on the name of Christ by abusing its intended purposes and power. (I ask this with humility, love and respect) I have a question about presuppositional apologetics: When speaking to a Muslim presuppositianlist, in order to sway him from his presupposition that the Qur’an is the word of god, we then uses internal inconsistencies within the Qur’an to undermine his position. Doesn’t this use of “evidince” show the ultimate need for evidence and logic when discussing apologetic issues? “God” is just as much of a red herring as “Allah” is. I can’t say this enough: True reason is based on real, observable evidence. Thanks, humanistfox. I hope for as many encounters as possible with Muslims that they would hear the Gospel of Jesus Christ and be set free from their sins, just like you can if you would humble yourself in the fear of the Lord and cry out for mercy to the God who created you in His image. What is “true” reason, and how do you *know* the reason is true? you must abandon your position. 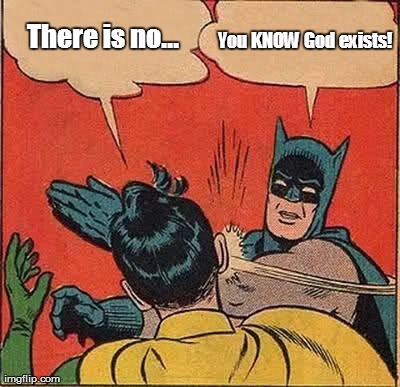 it is just a lack of belief. them how they know what they know). How do you know what you know? U: It says it in the Holy Qur’an. C: What does the Qur’an say about the Bible? C: Then you are not a good Muslim and have not been reading your Qur’an. U: ALLAH AKBAR! I KEEL YOU! C: Okay mate don’t take this too seriously, you are only role playing here. (Surah 6:114) so why don’t you believe what it says? whether or not the words of Allah can be changed? cannot be changed with your claim that the Bible has been changed? a Pastafarian and now believe that the Flying Spaghetti Monster is my god. U: Yup, I’m a Pastafarian, refute my god. with his noodly appendage and implanting this knowledge into my head. microphone and tell the world what it takes to deny the God of Scripture. Justin, I thank you deeply for your thoughts on this matter. I work for AiG and am dealing with getting slapped from both the evidentialists and the “extreme presuppers” in regard to the debate and the strategy we used. I was involved in the debate prep and share the responsibility for any error with Ken. I am deeply discouraged this morning, to the point of tears, by some of the bickering and the many lost souls railing against Christ on the Facebook pages I monitor. I know the debate wasn’t perfectly executed, and so does Ken. But I think it was glorifying to Christ and exalted His Word as the authority. The TAG might not have been employed to the extent that some would have preferred, dashing Nye’s head against his faulty foundation until his brains fell out, but that was not Ken’s goal. The audience was far broader than just Bill Nye. Many in the audience of millions were surely already being drawn by the Spirit. Others were being hardened by the proclamation of the truth. I trust God will be glorified in all of this and pray I have not done anything to sully the person and work of Jesus Christ. Roger, I am greatly encouraged you found comfort through this blog post. I too share your weariness in how some have treated Ken and AiG. It wasn’t really the point of the article, but I did at least want to link Tony’s article as an example of how we should interact with nonbelievers. Ham’s testimony is one to follow, as he engaged Nye with respect, humility, patience, and compassion. More than that, he asserted the authority of Scripture and unashamedly preached the glorious Gospel, which neither evidences or destroying worldviews can match. Thank you for your work and the time you took to share your thoughts. May you and the AiG team be resting in God’s infinite grace and love and trusting His Eternal Word will not return void. Blessings, brother! Roger, I sympathize with your predicament. James White did a review of the debate but focused on the patronizing words of Bill Nye and his unsupportable positions. Dr. White did not like the way the debate was constructed in that Ken Ham was in a losing position before it started because of the debate structure and that there wasn’t cross examination. You may have not been able to get Bill Nye to agree to anything different and had to take it or leave it. I applaud the effort and I imagine we can all learn from it, except Bill Nye. I encourage you to listen to The Dividing Line and hear the review by Dr. White which shouldn’t sting too much and may give you a few laughs you need right now. Great article Justin. I’ve been using the presuppositionalist argument for a while now, and this article is a good reminder. You can check out my website at http://www.godorabsurdity.com Btw the role play you posted is by Sye Ten Bruggencate. Brendan, thanks for sharing your website – I’ll check it out. I thought that might be Sye’s role play, but hadn’t verified it. Appreciate that too. I would certainly echo Greg’s recommendation to hear White’s critique of the debate. While he is certainly a supporter of your position, I think his experience is valuable and his criticisms worth considering if and when you guys do something similar in the future. As I understand it, the Nye debate was Ken’s first of this magnitude, so I don’t expect everything to get covered or all the “ts” get crossed. For what it was worth, he did a fine job for it being his first, so take all the Monday morning quarterbackers with a grain of salt. Public debate is a different animal altogether than a written debate. The structure and subject debated certainly defines the tone of how it will go. It is a skill a person has to develop, and that takes time. Thanks Greg and Fred, I’ll be checking out White’s critique. I enjoyed this post immensely. Thank you for sharing your insights in how we are to conduct ourselves when dealing with those who don’t yet believe or think like we do. Humility is the order of the day. Amen, brother, and I thank the Lord it edified you.